"The biosphere is a product of constant change. Of course the rates and impacts of this change vary greatly as periods of surprisingly conservative evolution are followed by truly revolutionary shifts in the composition of species or abundance of biomass or as incremental and localized changes get suddenly swept away by new environments...."
"Above all, the Earth's atmosphere was changed in the intervening time because of the accumulation of molecular oxygen generated by water-splitting bacterial and plant photosynthesis. In turn, the oxidizing atmosphere made it possible to shield the biosphere against UV radiation with stratospheric O3 (ozone) and to produce such abundant compounds as the metallic oxides and biochemically important soluble nitrates and sulfates needed for biomass production." "Life also molded the appearance, structure, and chemistry of the planet's surfaces and composition of its waters." "Lovelock went even further, considering the Earth to be a superorganism capable of homeostasis on a planetary scale maintained by life on the surface." "the biosphere as an active adaptive control system...."
What does the Gaia principle accomplish? Is it to maximize all three? "He (Lovelock) concluded that this superorganism has the capacity to regulate its temperature and that its health can be measured in the abundance of life." "The biosphere's...immediate future that appears to place our species at perhaps its most decisive evolutionary junction." "The diffusion and complexification of human societies have led to a large array of environmental changes that have transformed this planet during the last 5000 years and particularly during the past 100 years more rapidly than any other biogenic process in the planet's history." ".... Both the rate and the depth of the anthropogenic change accelerated with sedentary agriculture, whose practice often preceded by large-scale deforestation and maintained by intensifying inputs of nutrients and water." "Inefficient fossil fuel combustion is not the only source of carbon monoxide." "Acidifying deposition (wet and dry) arises from atmospheric oxidation of sulphur and nitrogen oxides. "The first systematic measurements of background CO2 levels began in 1958 at Mauna Loa and at the South Pole. "This increase of more than 30% in 150 years is of concern because CO2 is a major greenhouse gas whose main absorption band coincides with the earth's peak thermal emission." "Anthropogenic CO2 has already increased the energy reradiated by the atmosphere by 1.5 watts per meter squared." 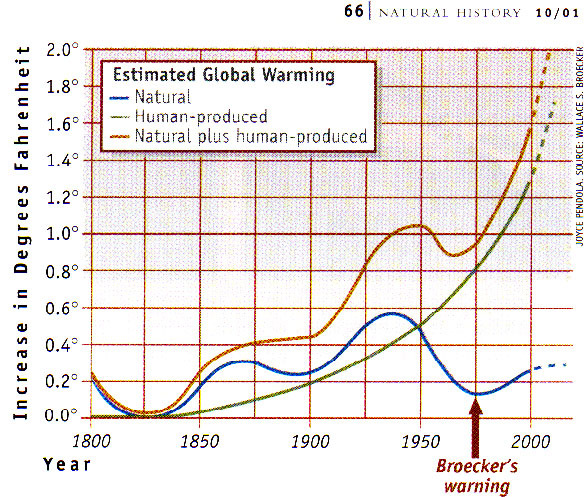 "total forcing by other greenhouse gases now roughly equals that of CO2 ." "As previously noted, methane levels have roughly doubled during the industrial era, to about 1.7 ppm by the late 1990s." "The combined direct and indirect effect of all greenhouse gases resulted in total anthropogenic forcing of about 2.8 watts per meter squared by the late 1990s. atmospheric concentrations have been falling since 1994, " the long atmospheric lifetime of CFCs means that the stratospheric effect will be felt for decades to come..."
may return to pre CFC levels by 2050. Mathews (1983) put the global area of preagricultural closed forests and woodlands at 61.5 million square kilometers and estimated that it was reduced to about 52 million square kilometers by the 1980s, a decrease of some 15%. "Two conclusions transcend any inevitable differences in such estimates; human actions have converted a significant share of all natural terrestrial biomes to other uses, and they have also modified, and often degraded much of the remaining area of these ecosystems. "Adding up these impacts reveals the total area strongly or partially imprinted by human activities is about 70 million kilometers square, or no less than 55% of all non-glacial land. ".. And large areas of grasslands and wetlands continue to be lost through misuse, conversion to cropland, or aquaculture. "Yet another way to look at the extent of the intensity of the recent transformation of the biosphere is to estimate the share of GPP (Gross Primary Productivity) consumed or otherwise processed, managed, or disposed of by human actions." "illustrates the intensity of the biosphere's transformation." "The implications of this impact on biodiversity and on future economic development are obvious, because even when one starts with the low share, two more consecutive doublings would do the impossible and appropriate the entire NPP for human use."